For our last day in Iloilo, we decided to visit the island province next door, Guimaras. We were at the Ortiz Port near Ateneo de Iloilo at about 9 a.m. and from there, we took a 15-minute pump boat to Jordan for PHP11. We had arranged for a minicab to take us around for PHP1000 (they have rates at the tourism office at the port based on distance) since you need to have your own vehicles to check out the sights. 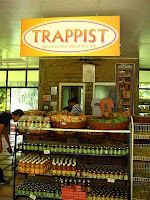 Our first stop was the OLP Trappist Monastery in Jordan where one could buy various products, mostly made from mangoes, such as jam, yema, candies, tarts, bars, piaya, and many more. 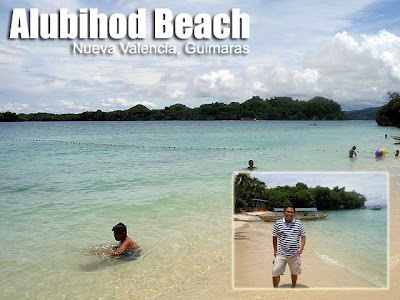 We then proceeded to Alubihod Beach in Nueva Valencia for a swim in the waters of Guimaras. Don't worry about the oil spill since it's in a different part of the island. 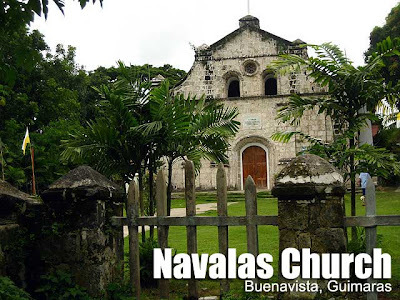 After an hour of swimming, we were off to the Navalas Church in Buenavista, the oldest Church in the island. Although the facade is perfectly preserved, the other parts are totally gone (walls and interior) as a result of renovations by several priests (as always). 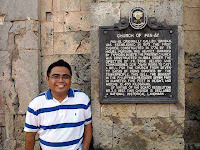 Why can't they just preserve these old churches, especially since this seemed to be the only one in Guimaras. 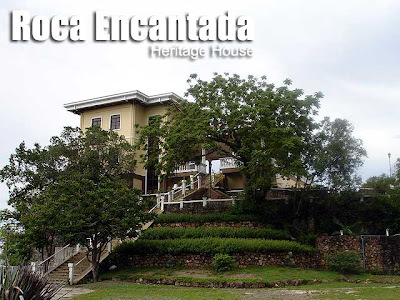 Nearby is the Roca Encantada Heritage House owned by the Lopez Family. We were lucky enough to be given permission to enter the premises. From afar, I thought it was a modern vacation house until I saw the marker. I could not understand how this modernized house got the seal of approval of the National Historical Institute for Heritage House. There are fewer traces of the original features of the house. With all their wealth, I hope the Lopezes restore even just the exterior of the house back to the way it looked before so that it lives up to the prestige of the NHI marker. I also hope they install the marker in a better way since it was just attached to a piece of wood. Markers like these should be screwed to a hard surface like a wall. 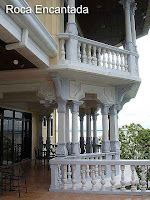 But the setting of the house was so picturesque with the balconies offering a 180-degree view of the sea, Siete Pecados Islands and its lighthouse, and the nearby islands of Panay and Negros. We had to rush back to Iloilo City since we had one last stop, Breakthrough Restaurant in Arevalo District, which is very popular for its seafoods. It was a treat of Danya's family. 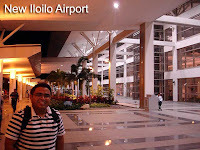 After a sumptuous feast, we made our way to the Iloilo Airport in Cabatuan. This new airport shames our crummy Manila Domestic Airport. And mind you, we paid a terminal fee of PHP30 compared to the shabby Manila Domestic's PHP200. After the activity, I proceeded to Jaro to meet up with Eugene Jamerlan of the Iloilo City Cultural Heritage and Conservation Council (ICCHCC) who took me and HCS Youth members Bernard Arellano and Gian Alvarez on a walking tour of Jaro. We first entered the Locsin House and walked around the plaza towards the Magdalena Jalandoni House. We also passed by the Old Jaro City Hall which is now a police station. 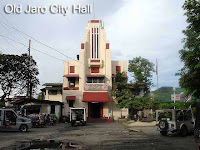 Before Jaro and the other districts of Iloilo City were merged together, Jaro was a city itself. 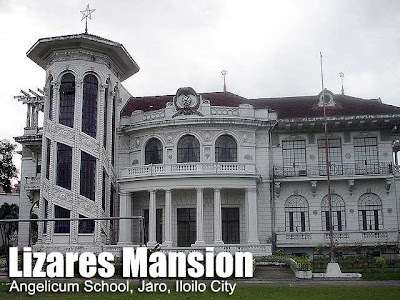 Of course there's the Ledesma Mansion, one might say a story of stupidity. They thought that there was treasure buried in front of the mansion and started to dig. As a result, the facade of the mansion collapsed. They did not realize that the treasure was their house. On the way, we bought some Iloilo bibingka from a street vendor. These are flat pancakes about two inches in diameter sold in paper bags of 10 pieces for PHP20. I really like trying out the local street food since it gives you a feel of the locality. We also visited the ancestral home of Marikit Javellana which is now in a rundown area of Jaro. How sad it is to see how these grand streets have deteriorated through the years. Our last stop is the Lizares Mansion which is now the Angelicum School. We got to check out the interiors as well. The grand ballroom inside is now a chapel. But despite the years of wear and tear, you can still see its former grandeur. 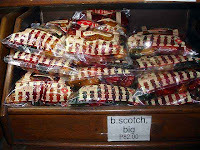 I went shopping at the Original Biscocho House since I am a fan of their butterscotch. I was introduced to these baked delights way back in high school by my friend Babits Guadarrama who is a granddaughter of the owner if I'm not mistaken. The are more goodies inside and to me, it's a must for pasalubongs. 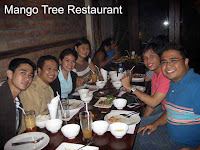 I then met up with the rest of the Ateneo people at SM City Iloilo since Francis Trenas was treating the Jesuits and us to dinner at his David's Tea House. After that sumptuous dinner, the Jesuits dropped us off at Smallville again where we had some drinks. More photos in Multiply. Today, we launched the Ateneo Alumni Association - Iloilo Chapter at the Ateneo de Iloilo campus. 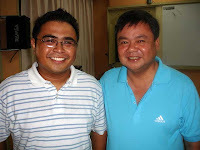 Of course, Iloilo City's top Atenean, Mayor Jerry Trenas, was there to grace the occasion. To all the alumni of the Ateneo de Manila University based in Iloilo, you can contact Danya Jacomille at (0917) 3000030 to join the chapter. We will be in Davao City on September 29 to launch the AAA chapter there. Calling all Ateneo de Manila alumni in the Davao area, do join the fun! That same day, we also created the HCS Youth - Iloilo Chapter. 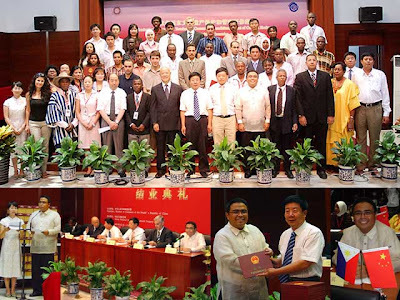 Elected president was Gian Carlo Alvarez of Central Philippine University. Calling all young heritage enthusiasts and advocates in Iloilo, you can contact Bernie Arellano at (0916) 3820555 to be part of the group. They've in fact launched their first project, a heritage blog. 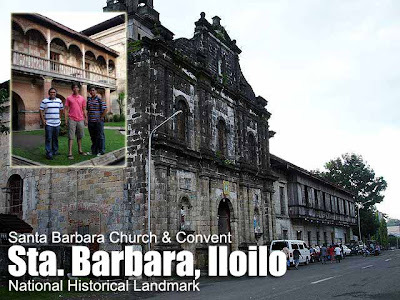 Explore the old world charm and the rich cultural heritage of the city and the province of Iloilo and Guimaras by visiting Panubli-on: The Iloilo Heritage Blog. I flew to Iloilo today to attend tomorrow's launching of the Ateneo Alumni Association - Iloilo Chapter. Our flight arrived at the new Iloilo Airport in Cabatuan, Iloilo at 6 a.m. We decided to proceed first to our hotel in Iloilo City to drop off our stuff. Since Sta. Barbara and Pavia were along the way, we decided to pass by to check out their churches. We had to pay PHP200 for a taxi since the new airport is several towns away from Iloilo City. Before proceeding to the bus station for Roxas City, we had batchoy for breakfast at Ted's. The bus to Roxas was about two hours and costs PHP113. 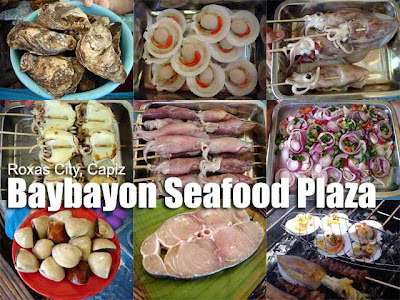 We arrived at 11:30 a.m. and went straight to the Baybayon Seafood Plaza in Baybay Beach to savor the seafood. 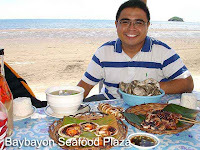 Capiz claims to be the Seafood Capital of the Philippines. The food was great and really cheap! We were shocked our bill was just PHP334. The small batya of talaba (oysters) was just PHP25; scallops were PHP5 a piece; the big pusit was just PHP40 a stick; cagaycay (shells) for the soup was PHP35; the slice of blue marlin was PHP80 and the kilawin was just PHP25 a serving. 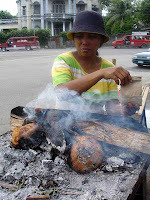 The non-seafoods include pork barbeque at PHP10 a stick and tayuba (liempo) at PHP35. 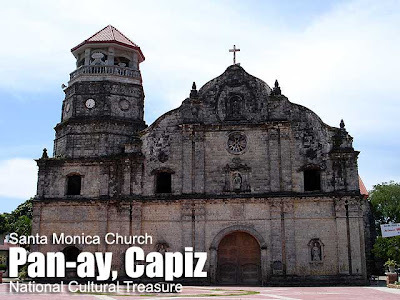 From Baybay, we took photos at the center of Roxas City, where you can find the Capiz Provincial Capitol, the Cathedral and Panublion Museum, a water tank which was converted into a museum. We then took a jeep to the town of Pan-ay to check out the church and the largest bell in Asia (the third largest in the world). The Pan-ay Church is a National Cultural Treasure and National Historical Landmark. We then went back to Roxas City, and took a bus back to Iloilo City. Traffic was bad when we got back so we didn't have much time to rest before dinner with the Ateneo alumni. My SSEAYP batchmate, Winwin Sanchez, dropped by the hotel to say hi. Then the group of Tito Chito Tinsay, Danya Jacomille and Pam Go arrived to pick us up for our dinner at the Mango Tree Restaurant, owned by Ateneans as well. The ambiance of the restaurant was great. They have a large garden at the back which one could use for functions. Don't forget to try out their sizzling bulalo steak and their frozen mango iced tea which I liked very much. If you thought the night was over, it wasn't! The group proceeded to Smallville to hang out. Smallville rocks! This is the new hip nightlife area of Iloilo City. We didn't stay up too late since the launch was the next day. More photos in Multiply. We seem to forget there is a delicate balance between man and nature that needs to be preserved. Such a balance was close to perfect in the Rice Terraces of the Philippine Cordilleras until neglect came into the picture. I've always lamented the fact that the Banaue Rice Terraces are now the Banaue House Terraces with so many unsightly structures built on them. I understand the need for more homes in the area to shelter the growing population. But can't they be built the traditional way so as not to destroy the landscape, the very cultural landscape which gives them funds to build their new structures in the first place? 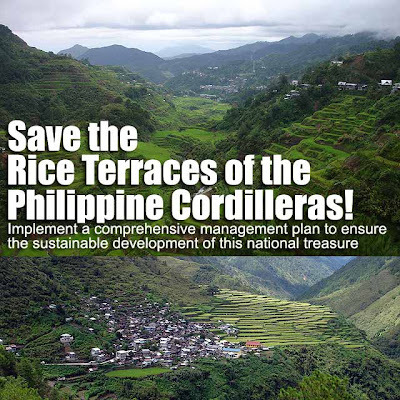 The UNESCO has spoken: restore the Ifugao Rice Terraces or it's out of the UNESCO World Heritage List! Those shanties and other unsightly buildings must go! If new structures must be built, let them mimic the traditional Ifugao homes with cogon roofs and wooden walls. In fact, although it may be artificial, I feel covering all those structures with cogon would make a big difference. Or maybe the architects of the UAP can propose designs for affordable houses similar to the traditional ones which would give the Ifugao modern amenities but still preserve the cultural landscape. What do you think? The United Nations Educational, Scientific and Cultural Organization (Unesco) on Thursday said the scenic Ifugao Rice Terraces in the Cordilleras was at risk of being stricken off the World's Heritage List should the Philippines fail to restore it in two years. Carmen Padilla, commissioner of the Unesco National Commission of the Philippines (Unacom), advised the government to take immediate measures to preserve and prevent further deterioration of the terraces, now included in Unesco's "Danger List" of heritage sites. In a media forum at the La Dulce Fontanana in Greenhills in San Juan City, Padilla scored the construction of shanties and other structures on the centuries-old rice terraces in the upland Cordillera region. Radio station dzBB quoted Padilla as saying that the structures may deface the site should an earthquake rock the region. I arrived really late since I came from another event. More than half of the bloggers had left already. But at least the travel bloggers had fun. 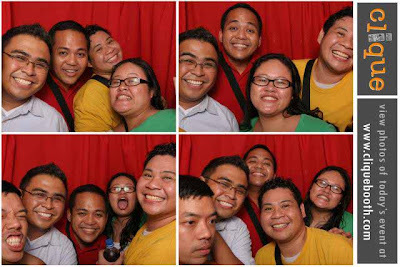 Here's myself, Anton of Our Awesome Planet, Ivan ManDy of Old Manila Walks, Eric of Byahilo.com, and Nina of Justwandering.org in the CliqueBooth. Yesterday was my last day in Beijing. In the morning, we had our closing ceremonies at the China National Institute of Cultural Property. 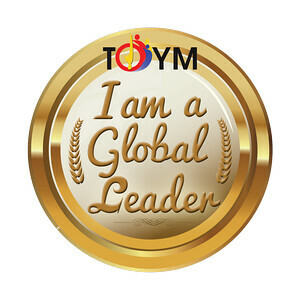 I was asked to give a speech in behalf of all Asian countries present and blurted out a few Chinese lines I practiced the night before. They gave us our certificates and really nice tokens. A lunch banquet followed and it would not be complete without the traditional Chinese toast "Gan bei!" which means "Bottoms up!" In the afternoon, I met up with my SSEAYP batchmates Pam and Edwin who were in Beijing for the 2nd China-ASEAN Youth Camp (I was a delegate during the 1st CAYC last year). What a coincidence that my schedule coincided with this year's camp. 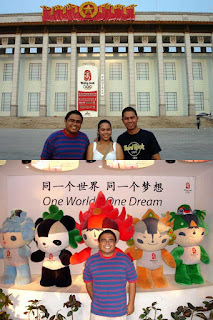 We met at the Beijing Olypics Countdown Clock in Tian'anmen Square and proceeded to Houhai/Shichahai from there. Houhai is famous for its nightlife and chic bars and restaurants by the lake. I joined them back to their hotel because I wanted to meet Wu Wei of the All-China Youth Federation. He invited me for drinks so we went back to Houhai. We took a cab since Wu Wei said he could not drink with me if he brought his car. Now that is being responsible! Even on weekdays, the place is teeming with people. Nightlife is indeed alive in Houhai! And there were so many choices. 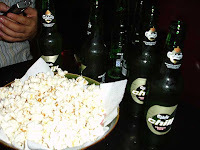 We finally went to Lotus Blue Bar & Restaurant, downed half a case of Carlsberg there and played a dice game popular in bars to determine who drinks. It was all fun for my last night in Beijing! Photos are in Multiply. While I was in China, an article by Malu Fernandez was e-mailed to me. When I got back, I realized the issue had been raging in the Internet for days. As a travel writer, I am unimpressed with her article. It does not give readers a sense of place of where she's been. Who cares if you used gold, open-toed sandals to climb the Acropolis? It's pathetic that the Hellenic attractions were only mentioned in passing. As a Filipino, I am appalled. How dare you call this country God-forsaken! You've even insulted your own countrymen. If you want to read reactions to Malu's articles, simply type "Malu Fernandez" in Google. Trust me, they can get really nasty and I'm sure they'd give any reader a good laugh. I hope she learned her lesson. But everyone is waiting for her apology. And until she gives it, I don't think we will hear the last of this Malu Fernandez fiasco. I join the blogging community in expressing my indignation. 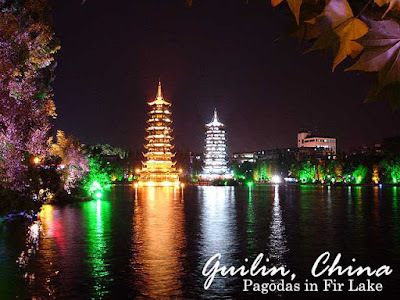 A trip to Guilin would not be complete without a cruise along the Lijiang River. We had a fantastic cruise along the Lijiang River today! 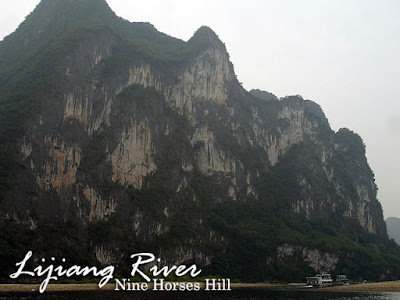 The picturesque karst landscape was simply spectacular despite it being a cloudy day. Our group left downtown Guilin at about 8:15 a.m. and was at the wharf 45 minutes later. I was surprised to see so many cruise ferries waiting. There were just so many tourists, both local and foreign! Cruise ferries in fact left almost every 5 to 10 minutes. The trip down the river would take about five hours. Buffet lunch is prepared and served on board. It was drizzling when we left the wharf. But that did not hamper us from proceeding to the roof deck of the ferry to enjoy the great scenery. 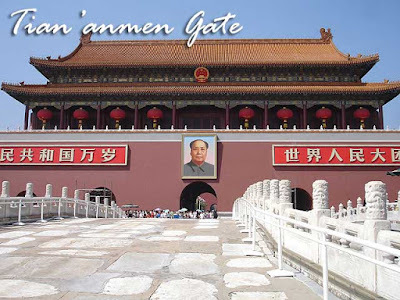 Indeed, this is a highly-recommended tour which one must include in a China itinerary. In fact, the Lijiang River Scenic Zone is in the China tentative list for UNESCO World Heritage inscription. 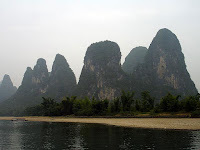 I'm sure the scenes from the Lijiang River below which I uploaded in YouTube will definitely whet your travel appetite. Despite the fact that I wanted to sit down and relax in the air-conditioned area below, I just could not leave the roof deck since every curve and turn along the river offered new surprises and better views. Observing the daily life along the river was a very enriching experience. And it was amusing seeing how vendors sold their wares on a higher level because they would try to catch the ferries, rowing their rafts towards us and hooking them to the cruise boats as soon as they made contact so that they could sell their wares to the passengers. 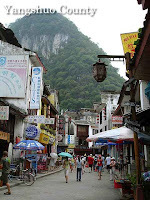 At the end of the cruise is Yangshuo County which has an old town that is well-preserved but has been transformed into a tourist trap. Souvenir shops and inns now occupy this old settlement along the Li River. There were so many people, I found it difficult to move around. But at least all the old buildings were preserved and have become economically viable. I have a lot of photos in Multiply. The karst limestone landscape of Southern China are a recurring theme in many old Chinese paintings. 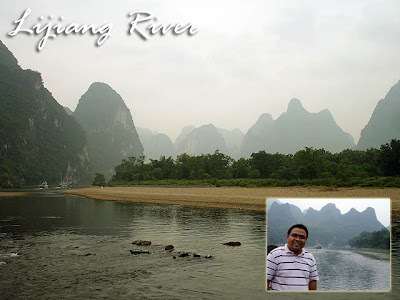 And it was thus a pleasant surprise for me that the group was visiting Guilin, a city set amidst picturesque karst mountains, which is very famous in China for its fantastic natural and man-made scenery. 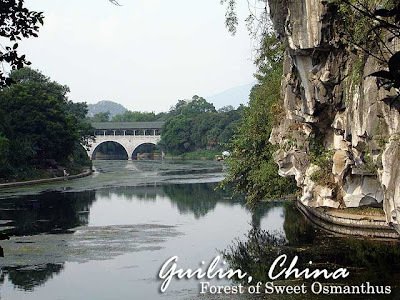 Many Chinese say that Guilin's scenery is the "finest under heaven." The name of the city literally means "forest of Sweet Osmanthus" because of the large number of fragrant Sweet Osmanthus trees in the city. It’s a three hour flight from Beijing. There are also flights from other major cities such as Guangzhou and Shanghai. As soon as we left the airport, the karst mountains greeted us. 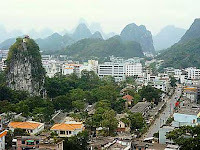 What is great about Guilin is despite the growth and urban development, they have managed to preserve most of the karst mountains as well as the old water system which linked the city together. It’s sad when I think about Baguio City since informal settlers have already occupied the once picturesque views; and there seems to nothing left of the natural environment. Same goes for the Pasig River and the esteros of Binondo and Sta. Cruz which I hope the City of Manila cleans and revives. We arrived in time for lunch at the Shan Hu Hotel. The hotel is in downtown Guilin and it gave us a great view of the square in front of it. After lunch, we were given ample time to rest. But I decided to explore the vicinity. 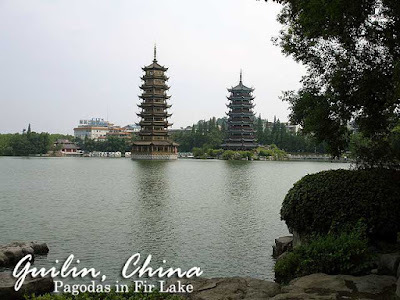 I visited Fir Lake beside the hotel which has two charming pagodas along the banks. After walking around, I rushed back to the hotel to catch our bus. For the afternoon, we visited the Guihai Forest of Steles Museum. 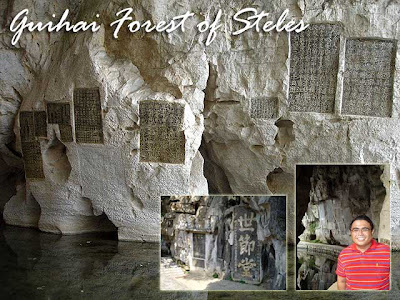 It’s a collection of over 200 steels carved around the karst mountains and its different caves. You could see that they come from different periods dating back to the Sui Dynasty since there are steles with the old Chinese calligraphy that is no longer in use. In the evening, I went around the vicinity again. It was an incredible sight as the city's waterway areas were fantastically lit! Today, we visited the Jing Jiang Palace, the seat of government of Guilin during imperial times. The Jing Jiang princes were generations of Ming princes dispatched by the emperor to govern Guilin. At the back of the palace was an example of an Examination Hall where examinees sweated it out for three days and three nights answering the difficult examinations which were administered during imperial times. 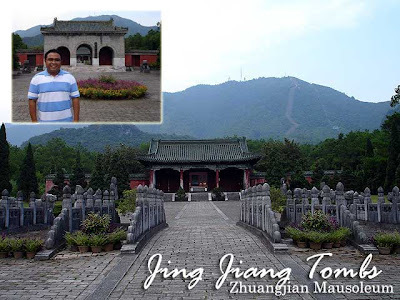 In the afternoon, we went to the Jing Jiang Mausoleum, the burial grounds of the Ming princes. They are located five kilometers from the city center, at the foot of the grand Yao Mountain. Only one of the eleven tombs has been restored, namely the tomb of Zhuangjian. The setting of the tomb was panoramic as it was built amidst lush pine trees and surrounded by hills and mountains. 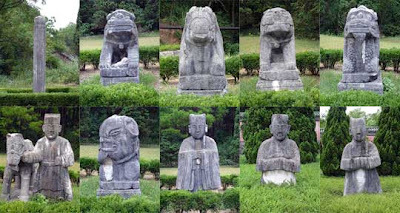 Ten figures can be found of each of the two side of the ceremonial way to the inner palace, which include animals such as elephants, unicorns, and pixiu. We had a forum with the local heritage managers in one of the halls of the tomb complex. Then it was back to downtown for dinner. Tomorrow we take a cruise along the Lijiang River! 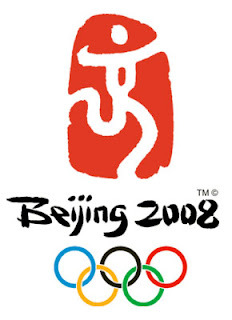 On 8:08 p.m. of 08/08/08 (August 8, 2008), the 2008 Beijing Olympics will begin. It’s one big party in Beijing today as China and the world counts 365 days to the opening of the Games of the XXIXth Olympiad. I was planning to join the party in Tian’anmen Square but ended up watching the ceremonies on TV instead. I was in the center of Beijing today for a change in routine. It took me quite a while to get there from my hotel which is along the North 4th Ring East Road near the construction area of the National Olympic Center (I should check that out one of these days). The hotel is about a kilometer from the nearest subway station. 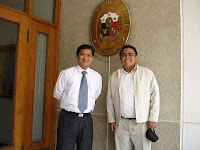 First stop was the Philippine Embassy to meet up with my brod who is consul general in Beijing. We had lunch at Friday’s (after having Chinese food three times a day everyday for the past week, one craves for a change). After lunch, I took a subway to Tian’anmen Square. I had wanted to check out the countdown clock again but the whole square was cordoned off in preparation for the program in the evening. Oh well! There goes my revisit to Chairman Mao’s mausoleum. Crowds were already waiting along the sides of Tian’anmen. There were even people passing the time in the pedestrian underpasses since it was so humid outside. 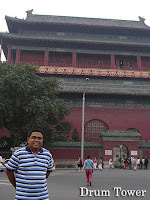 I walked towards Qianmen and from there, took the subway to Liulichang Cultural Street. Known for its cultural stores housed in restored old shop houses, Liulichang is a must-visit if you like the feel of old streets or like collecting antiques or art. 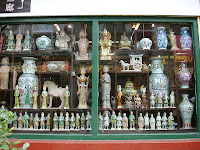 You can find a lot of antique stores, calligraphy and art galleries, bookstores, tea houses and small shops selling miscellaneous cultural stuff (but no commercial souvenirs like those in Sichahai). Just like always, bargain hard. I got myself some really nice ceramic figurines for one-third the original price (I feel I could have gotten them even lower). Exhausted by the humidity, I decided to make my way back to the hotel. Beijing is just so big, I’m getting so much exercise from the long walks. One more day of lectures before we fly to Guilin for the weekend. I heard it’s really nice. 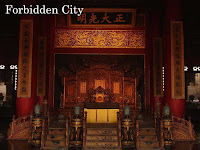 I wasn’t that excited today maybe because I was at the Forbidden City just last October. It was also a Sunday, and I was expecting a large crowd and I hate going around heritage sites when they are crowded. My expectations were not unfounded. 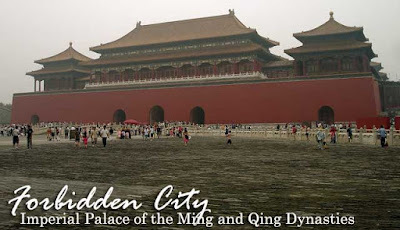 There were just too many people and you had to jostle your way to see the different areas of the Forbidden City. Add to the fact that many of the major buildings were undergoing restoration and still covered by scaffolding. I was hoping restoration works on the main palace was finished by now since it was also covered last year. But it was not yet completed. So I just made good use of my time and strolled around the palace complex. Like yesterday, we had lunch in the bus. They took us to the Yashow Clothing Market in the afternoon but that did not interest me (as a general rule, if it’s something I can buy easily in the Philippines, I won’t buy it). So I asked permission from the organizers to separate from the group. Boris from Serbia joined me to Beihai (North Lake) Park which I had wanted to see during my trip last year. We took a taxi from the market to Beihai which was RMB20 (PHP140). Had I known it was a clothing market, I would have stayed behind at the Forbidden City since many of the historical sites are nearby. Entrance to the park is RMB20. 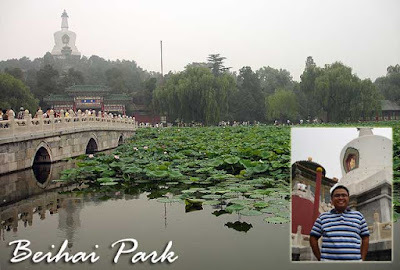 Beihai Park was part of the imperial gardens. 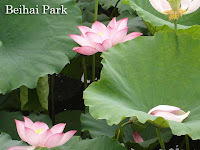 If not for the large weekend crowd, the stroll around would have been very refreshing with its large picturesque lake full of lotus plants in full-bloom and hundreds of trees. As they say, the garden has the dignity of the northern style and the exquisiteness of the southern style. Maybe I could come back on a weekday to absorb the scenery. In the middle of the lake is Qiong Island linked by two old bridges. 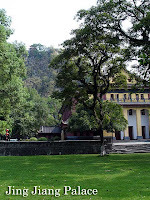 The island has a hill with several temples and shrines, and an imposing white Tibetan-style dagoba on top. 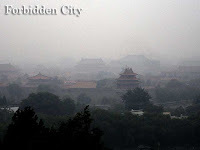 From the top, you could see the entire Forbidden City and other old structures in the vicinity. Sadly, the weather did not cooperate with us. Since it was foggy, visibility was low. We walked several hundred meters towards the north gate of the park to get to Sichahai for a rickshaw tour of the hutongs. I was there last year but it was in the evening. 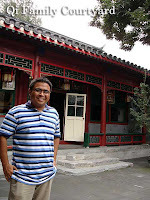 So I was not able to appreciate the hutong tour that much. 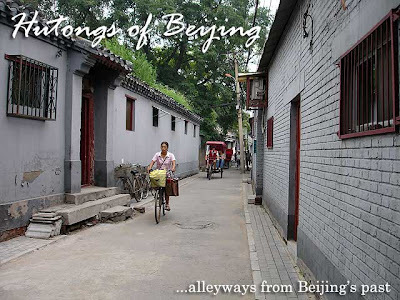 Hutongs are the alleyways which typified old Beijing. Outside the palace, princes, civil servants, wealthy merchants and other common folk lived in these hutongs. There are just a few of them left as many of them were bulldozed to give way to new developments. But the Beijing government put a stop to the demolition and preserved a large part of the hutongs close to the Forbidden City as a reminder of life before. Sooner or later, cities realize that preserving heritage is vital for their growth and development. And I hope local officials in the Philippines realize it sooner while there is still something left to preserve. One of the places we visited was the 300-year old Beijing courtyard style home of the Qi family (5 QianGan Hutong), which is one of a few well-preserved private courtyards open to the public (RMB20). One could see the development of the city’s hutongs by visiting these all-gray homes which are still in use. It amazes me how local and foreign tourists visited these alleyways in droves. And residents charge for entrance into their traditional homes. Imagine this happening in old Manila districts such as (Hidalgo Street) Quiapo, San Nicolas and San Miguel. While in Sichahai, don’t forget to check out Yandai Byway to shop for souvenirs such as Mao memorabilia, silk and traditional clothing, tea (although prices are outrageous), Chinese cultural items, as well as the usual tourist stuff like magnets, key chains, trinkets, etc. I didn’t buy anything since I wanted to reserve all my shopping towards the end of the seminar. But make sure you bargain hard since they overprice the items beyond comprehension. Don’t think an amount is too low because if you turn away, they might just say yes. I asked the price of a Buddha image and they said RMB260. I didn’t budge. Their asking price went lower but not that much. I said RMB50 and they laughed. When I left, they ran after me and said “Ok, ok, RMB50!” But I said I’m no longer interested and I’ll think about it. Who knows, I could have gone lower. From Sichahai, we walked towards the Drum and Bell Towers. I had seen these towers last year but in the evening. So I wanted to see them up close while the sun was still out. From there, we walked towards the subway station and took a train back to our hotel in the northeastern area of Beijing, just in time for dinner. Three years after Unesco's World Heritage Center released a scathing report on the country's poor management of its cultural sites, boom-time China is starting to realize that preserving archaeological finds can be more lucrative than developing shopping malls.